You know the movie Mallrats? Well, I was one. Back in the mid 90's, I used to spend EVERY. SINGLE. SATURDAY. at the best mall in Cleveland, the one and only Beachwood Place. I wandered through the stores with my friends, pretty much obsessed with everything I saw or tried on ... and, during one of these trips, my long-standing love of The Body Shop Glycerin Soap was born. I think I originally gravitated toward these vegetable-based soaps because of the price. I could stock up on every single one and not empty my wallet. But, after awhile, I kept coming back because they smelled fantastic and left my skin feeling amazingly soft and smooth. My favorite has always been (and will always be) Strawberry, the scent of which effortlessly brings a strawberry patch to life. 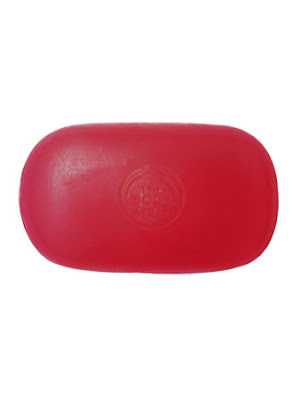 No matter how old I get, no matter how many different soaps I try, The Body Shop's glycerin soaps will always hold a special place in my heart. Try one for yourself -- you'll see! The Body Shop Glycerin Soap retails for $4 at thebodyshop-usa.com.